A search for native children who died on 'Outings' in Pa.
Libbie Standing died at 13, four years after she was sent from her Cheyenne tribal home in Oklahoma to the Indian boarding school at Carlisle, Pa. But she's not buried under one of the short, military-style headstones in the student cemetery, among nearly 200 boys and girls who perished at the school. She lies some 40 miles north, in tiny Reedsville, Pa., where she succumbed to meningitis after being loaned out to work as the child maid of a prominent white family. If she had a tombstone in the years after her death in 1884, it's gone. Young Libbie has disappeared into the grass-and-dirt expanse of Church Hill Cemetery. Now, a Native American rights group is searching for her — and for other lost children, bolstering its demand for a national accounting of Indian youths who went missing while under official supervision at dozens of government- and church-run boarding schools. The group intends to file a formal United Nations petition, calling on the United States to locate and identify all native children who were "taken into government custody" and whose fate and whereabouts remain unknown. "People are awakening to the reality of what happened, the human-rights violations, the civil-rights violations," said Christine Diindiisi McCleave, executive officer of the National Native American Boarding School Healing Coalition, known as NABS. "We want to know the truth." One expert estimates that the number of missing children could top 10,000. And the initial investigation leads straight to Pennsylvania. Across the central and eastern reaches of the state, native children known and unknown are buried, one here and one there, in burgs and boroughs and even in the metropolis of Philadelphia. Two children lie in the Byberry Quaker cemetery, just off Byberry-Southampton Road. City records show one is Gertrude Spotted Tail, the 14-year-old daughter of a famous Sioux chief. The identity of the other child is unknown. In Lititz, Pa., about 50 miles east of Carlisle, Alaska native Ephriam Alexander lies under a stone that misspells his name. He died of tuberculosis in 1905, likely having been drawn to Lancaster County by religious fellowship, and was buried in the Moravian Cemetery. "We know there are other children who are out there," said Louellyn White, a Concordia University scholar of Mohawk descent, who leads the NABS search, but "we don't know where they are." On Thursday, White arrives in Wallingford for a Quaker-sponsored conference on the trauma caused by early settlers of the faith who joined in genocidal undertakings against native peoples — and to try to find ways to right the relationship today. Indian leaders are coming from as far as North Dakota, Quakers from Colorado. 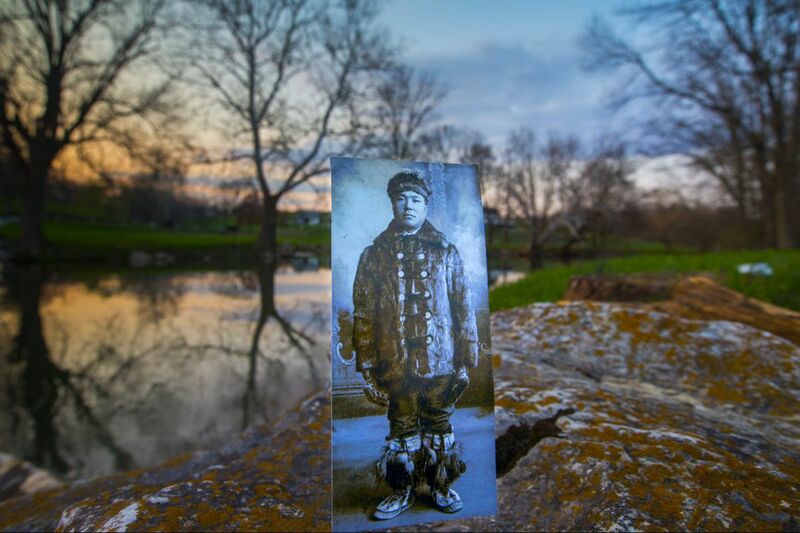 All the children missing or buried in Pennsylvania are believed to be connected to the Carlisle Indian Industrial School, the nation's first federal off-reservation boarding school, founded in 1879 by former cavalry officer Richard Henry Pratt. Carlisle — now the campus of the Army War College — was built to solve "the Indian problem" by forcing native children to become ersatz white people, erasing their names, languages, religions, and family ties. Religious leaders eagerly supported Pratt in what was considered an important national experiment. Chalk was cheaper than bullets, and forcing Indians to assimilate was considered more humane than killing them. Carlisle became the model for Indian schools across the United States and Canada, where epidemics, loneliness, and overwork claimed lives. Some of the children missing or buried in far-flung Pennsylvania locales died during a school program called "Outing," a name that sounds as carefree as a picnic. During summer months, and sometimes year-round, students would be sent from the school to live in the homes of white families, immersing them in the dominant culture. Carlisle administrations saw Outing as a potent means to promote assimilation. But Outing served another important purpose: It turned Indian children into a reliable source of cheap labor for local families and businesses. Boys worked as farm laborers, baling hay and handling chores. Girls were put to work as housekeepers, washing laundry and cooking. On Sundays, native children attended church with their host families, their conversion to Christianity central to Carlisle's mission. And they weren't always treated kindly. Carlisle student Jim Thorpe, later famous as perhaps the world's greatest athlete, was made to scrub floors and eat alone in the kitchen on his first Outing, at a farm north of Harrisburg, according to the Cumberland County Historical Society. Thorpe ran away, back to Carlisle. Those who died on Outing might be buried where they fell or not, their deaths officially recorded or ignored. Gertrude Spotted Tail was on Outing near Philadelphia when she died of pneumonia in August 1883, school and city records show, though her grave was unmarked until recently. David Nepley (left), the Byberry Friends clerk, and Charles Stehle kneel beside the grave of Gertrude Spotted Tail at the Byberry Friends Burial Ground in Northeast Philadelphia. Gertrude was a daughter of Chief Spotted Tail of the Brule Sioux. She died while a Carlisle student, staying with the Bender family in Bucks County. Gertrude and an unknown American Indian girl are buried side-by-side. Nepley put a blank marker there to mark the spot several years ago. White found a girl who drowned in the surf at Ocean City — but who could be buried in any of several places. Another boy may lie in Lower Makefield, Bucks County. "This is history that Pennsylvanians need to know about," White said. "This is what you were a part of, what your family was a part of, what your community was a part of." Between June 1881 and September 1887, Carlisle records show, children were sent on nearly 1,300 Outings, some to Bucks, Chester and Montgomery Counties, to New Brunswick, Trenton and Burlington, to Delaware, Maryland and New York. Their pay might be $5 a month, half of which was deposited in their school accounts, a lockbox that students had to fight to open. The typical laborer earned six times that rate in 1880. David Nepley (left), the Byberry Friends clerk, looks over a record of those buried in the Byberry Friends Burial Ground in Northeast Philadelphia. Among those buried is Gertrude Spotted Tail. A timeline of Libbie Standing's life and death in Pennsylvania emerge from school records, Outing reports, and newspaper articles. The daughter of Yellow Shirt was 9 when she arrived at Carlisle on Sept. 6, 1880. Three years later, on July 31, 1883, she was sent on Outing to the home of Mathew B. Taylor in Reedsville, on the banks of the Kishacoquillas Creek in Mifflin County. Taylor was a well-to-do farmer, known and admired for his intelligence and skill in business. In spring 1884, Libbie took ill with pneumonia. She recovered well enough to do light work but was struck by cerebral spinal meningitis and died on July 20. She was buried in the Brick Church graveyard, later renamed Church Hill Cemetery. Cemetery directories don't contain her name, and people who have walked the graveyard found no sign of Libbie. It's possible she once had a marker; some stones have eroded to nubs. "In Libbie," The Morning Star school newspaper wrote, "we have lost a bright and promising member of our school." While the setting is quite bucolic on one side, the other side of the grave of Gertrude Spotted Tail faces the back of nearby homes by the Byberry Friends Burial Ground in Northeast Philadelphia. Gertude was one of the daughters of Chief Spotted Tail of the Brule Sioux. She died while a Carlisle student visiting the Bender family in Bucks County. Gertrude and an unknown American Indian girl are buried side-by-side but no one knows which grave is which. A blank marker was placed there to mark the spot several years ago.